Moto3 and Moto2 round-up – Motegi: Track action at last sees Rins and Kallio on top. The usual suspects filled the top spots in a soaking Moto3, Moto2 saw the sun arrive and Mika Kallio shine. Moto3 had to endure a further delay after all the cancellations that went before it but when the action finally happened Alex Rins posted a time that was to be untouchable for his rivals. Maverick Vinales was also constantly at the top with the Estrella Galicia rider but had to give second best to his fellow Spaniard. They are joined on the front row by Rins’ team-mate Alex Marquez who was the last to cross the line and one of just a few riders to take advantage of the improving weather in the closing stages. Luis Salom sat in the pit as his time fell down the timesheets, late success moved him up into fourth for the Red Bull squad. Jack Miller had great grip, but his time which looked set to get him on the front row was a late victim of the flying riders Marquez and Salom, leaving him in fifth, but the top Honda. Sixth went to Isaac Vinales ahead of Gresini rider Niccolo Antonelli in seventh. Top wild-card rider Hiroki Ono was impressive in eighth as was his fellow home wild-card rider Sena Yamada who lead the early stages and qualified tenth. Jonas Folger finds himself sandwiched between the times set by the guest riders in ninth spot for Aspar. Hyuga Watanabe also put in a strong performance on home turf for twelfth. The Mahindra team had a nightmare session with a best of 18th for Miguel Oliveira, Efren Vazquez was even further off the pace in 21st. Just behind him in terms of time was Briton John McPhee in 22nd, Romano Fenati who had proven to be good in the rain in his rookie year couldn’t get his San Carlo Team Italia bike to do anything special and ended up in a disappointing 26th. Moto2 had very differing weather as the rain had stopped, the track was starting to dry and with a final twist in the weather – the sun arriving. Mika Kallio was consistent and a late lap gave him his first Moto2 pole for Marc VDS. The flying Fin has an excellent record at Motegi having won three times before at the Japanese Grand Prix. Joining him on the front row are Xavier Simeon and Johann Zarco, also a previous winner at the track in this 125cc racing days. The second row was filled by Simone Corsi, the top Speed Up rider, in fourth. Fifth went to Rafid Topan Sucipto after a shock best performance by the Indonesian in the tricky conditions. Next up on the grid are the Pons Riders, with Tito rabat in sixth ahead of championship leader Pol Espargaro, who didn’t capitalise on Redding’s injury woes, with just a seventh place start for the Pons rider. 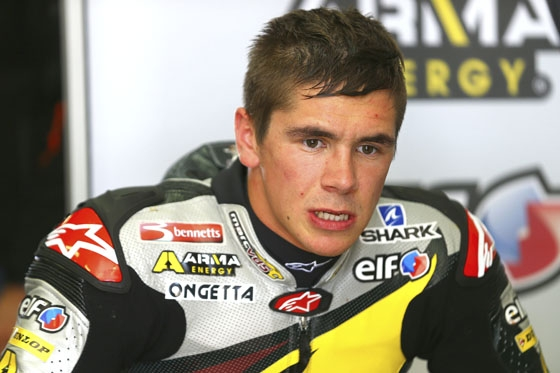 Redding is not too far off the pace given his injury. The Briton is in 15th and was 1.7secs adrift. His check post-session has cleared him to race on Sunday. The remainder of the top ten was filled by the ever reliable Dominique Aegerter in eighth, last years Moto3 race winner Danny Kent in ninth and early session leader Mattia Pasini in tenth. Gino Rea also had a strong session in his replacement rider role and starts from 14th. Top home rider was Nagashima in 16thahead of regular racer Taka Nakagani who is down in 23rdon the grid.